Happy New Year everyone!!! My kids are (finally) back to school today, so that means a million things to catch up on before the bus gets back home! 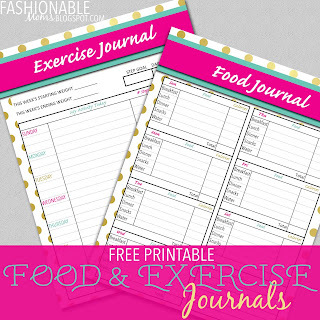 I'm sharing a printable set with you that I created to track my own food and exercise. I have a couple (or three or five) pounds to lose from my holiday excessive eating😳, so I guess it's time to get back on track! DOWNLOAD HERE! Gold dots background by https://www.etsy.com/shop/LagartixaShop. Created by Jamie/fashionablemoms.blogspot.com for your personal use. Professional printing allowed. Need a customized printable? Visit my Etsy shop! New in my shop: GIRLS BINGO Game! Free Printable: Owl Cookie Sales Goal Poster!